I love this clip for the simplicity of putting it on clothing. It's easily done with one hand. The length is a good length and can be adjusted for top of clothing so you don't have a massive but of fabric hanging around. The clothing clip is very big meaning you are limited in where to put it where it won't be in the way. I found it really difficult to get the clip on and off the dummy so I left it on one dummy thinking it was the easier option and put it in th box sterilisers that you get with the dummy. Don't do this. It melts the clip. I've have to throw that but away and am having to get replacements. No where in the packaging or in the instructions did it say the clip wasn't suitable for a steriliser. Would make it a much better product if you could leave it on and sterilise it. Stronger and more versatile than before, this new MAM clip it & cover can be used with a wide variety of soothers and other baby accessories. Thanks to its innovative adjustment feature, parents can alter the length of the clip for different uses. 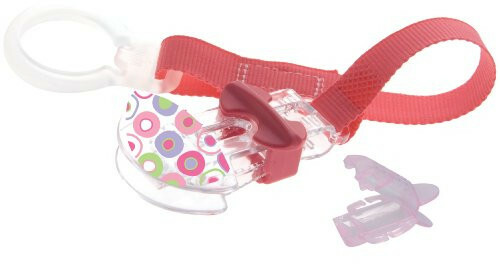 With its flexible strap, it's quick and easy to add ring-style pacifiers, teething rings, toys and more. The ring is simple to remove so that you can attach MAM dummies as well as other button-style pacifiers.